I would be hard pressed to pick my all time favorite fly tyer. So many have influenced me. For all around mastery, it's hard to beat my buddy Ted Patlen or Davie McPhail. 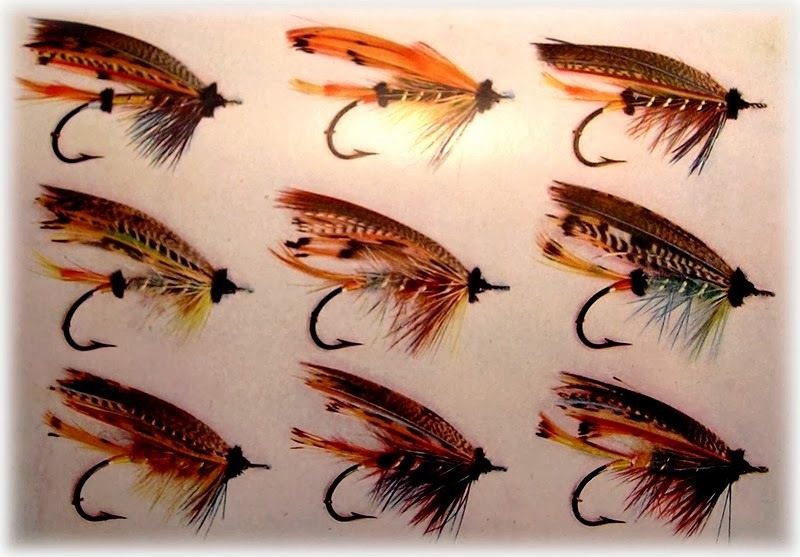 For hair wing salmon flies, Warren Duncan or Jerome Molloy. My pick for pure creativity is Jack Gartside, who is definitely in the running for all time favorite. 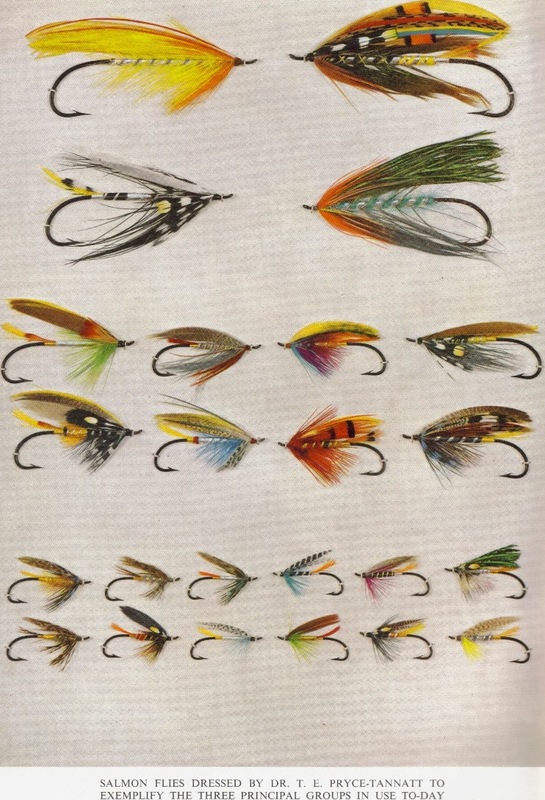 Classic American trout flies…Harry and Elise Darbee. 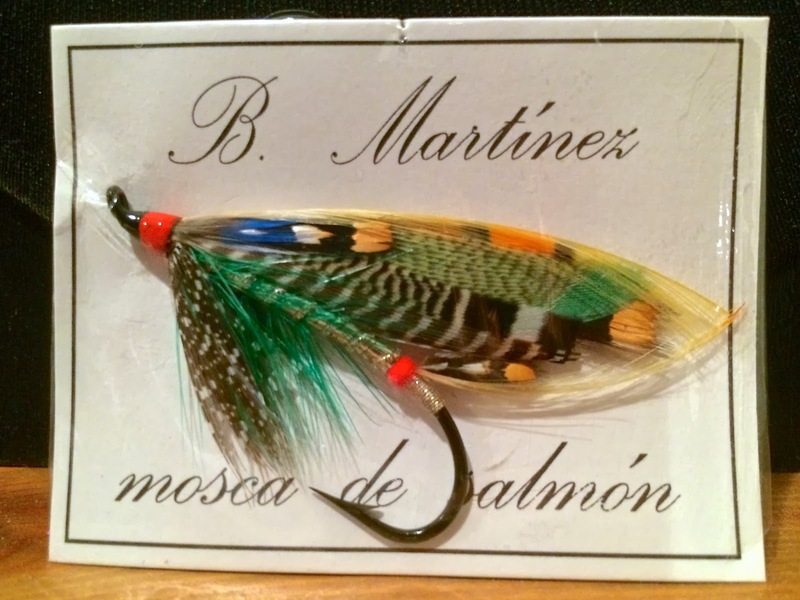 Modern American trout flies…probably John Barr. Flies tied artistically...my friend Paul Rossman gets the nod. There are many more categories and tyers…too many to mention. In the classic salmon fly category, two tyers vie for top honors. The first is Dr. Thomas Edwin Pryce-Tannatt (1881-1965), considered the last of the Victorian era tyers. While Dr. Pryce-Tannatt is best known for his classic book "How to Dress Salmon Flies: A Handbook for Amateurs" (1914), my favorite work of his are his late period flies. First, it's obvious that Dr. Pryce-Tannatt's tying skills improved greatly in the years between when his book was written and when he tied the examples from his piece published in The Field Annual (1952). Most of Dr. Pryce-Tannatt's later flies were dressed much simpler than the exaggerated Victorian era flies in his book. Classics were pared down to essential elements. Take the Jock Scott pictured above, for example. The body is dressed in typical Jock Scott fashion, but the wing is only made from white tipped turkey and bronze mallard. He omitted the bustard, multi-colored dyed swan, golden pheasant tail, etc., prescribed in his book. As fun as those grandiose old flies can be to tie, all the bells and whistles are unnecessary. His later flies were tied further up the shank (a sort of low water style) than what was traditionally done at the time. Wings rode low and were rarely longer than the hook itself. In terms of overall proportions, these flies really speak to me. They're perfectly tied but, at the same time, look really fishy to me. It's worth reading the piece which accompanies the selection of flies pictured above. Dr. Pryce-Tannatt goes into much greater depth on the evolution of salmon flies than I can here. The article can be found on the fantastic Feathers, Flies and Phantoms site. Not surprisingly, and as evidenced in the style of the flies above, Dr. Pryce-Tannatt mentions the influence both Ernest Crosfield and A.H.E. Wood had on the fly style of this transitional period. This unique Silver Doctor is both beautiful and built like a tank. Notice how the underwing and main wing are barely visible. Born in Spain and after the publication of Dr. Pryce-Tannatt's classic book, Belarmino Martinez (1919-2000) can hardly be considered a Victorian Era tyer. I suppose the term "neoclassical" might apply in his case. Whatever his classification, Martinez tied one heck of a salmon fly. I have to admit, Martinez wasn't always one of my favorites. His flies have a very distinct and sort of angular look to them. His arrow-shaped heads were lacquered, sometimes in unusual colors (brown or very bright red). He cut his toppings, giving them an abrupt taper. Martinez seemed to have a fondness for very wide strips of waterfowl flank feathers. Often times, the combination of bronze mallard, wood duck and teal would almost completely obscure the main wing underneath. 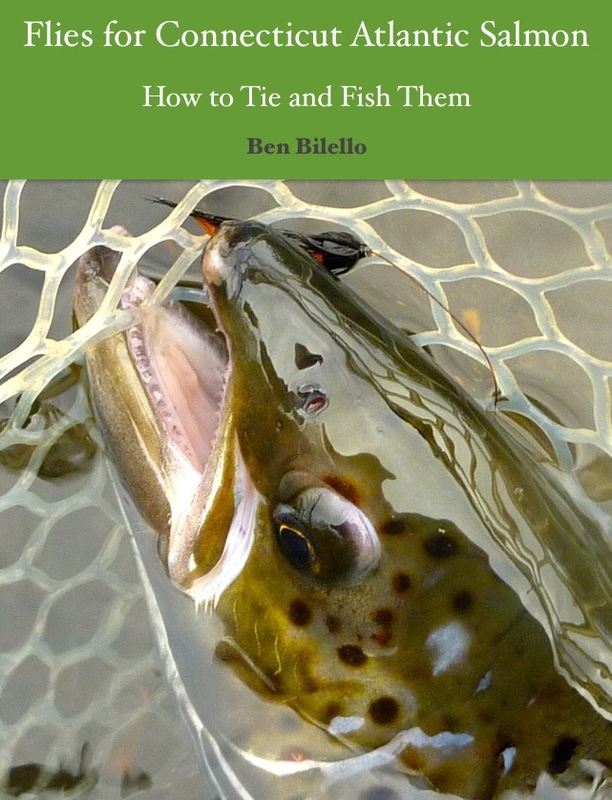 He threw out the notion that a classic salmon fly should have five turns of tinsel for a rib and often used almost twice that number (presumably for durability). 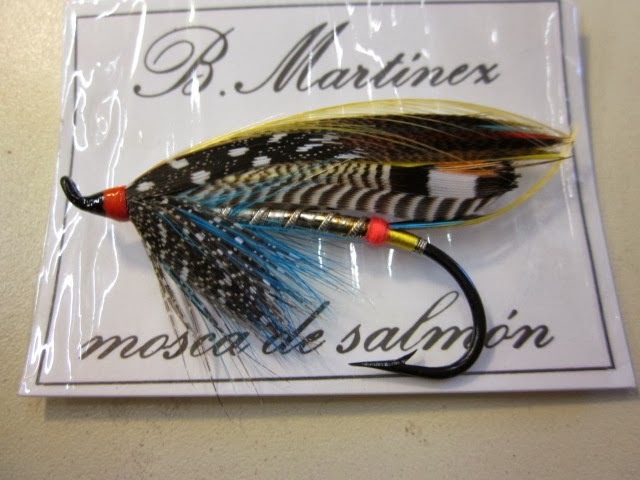 My fondness of Martinez's work grew when I acquired one of his signature flies, the "Silver Martinez." Being able to hold that fly in my hand made all the difference. I couldn't believe how well built that fly was. It looks like it could catch a dozen salmon before it would begin to break down. The taper of the body looks just right. These flies were tied to fish, but they were little works of modern art. They tip their hat to the old school Victorian tyers while having a look all their own. There are many other classic salmon tyers whom I admire but, at least at the moment, Dr. T.E. Pryce-Tannatt and Belarmino Martinez are the big two. While on wintertime home confinement, I am going to try to synthesize the style of the pair. It will be a work-in-progress and it might take me a while to get it right. These flies will be tied for fishing. Where? I have no idea yet but, given the opportunity and the right conditions, I am very eager to use them.